For me, going to the golf course with my girls is the highlight of my week. There is no greater satisfaction than seeing them spending quality time with them while also enjoying the “classroom setting” of the golf course. About a month ago, I came up with a trick to ensure that FUN is incorporated into our golfing adventure – the Golf Adventure Checklist. My goal with creating the checklist was to mix in golf, core values, manners, and fun whereas throughout our golfing adventure we could determine which activity we wanted to “check off” based on the mood of the girls. 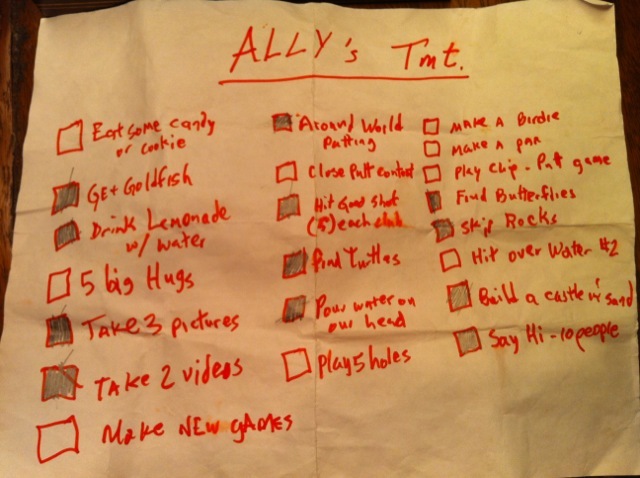 The Adventure Checklist worked to perfection in keeping the girls engaged with a task until completion and they loved the idea of having goals that they could mark off. Mix in silly fun activities – the more strange the activity, the more fun they will have checking it off. Don’t be shy on dumping water on your head or building a sand castle in the bunker. Identify non golf activities you want to work on with your child – Ally is a bit shy and we are working on her properly introducing herself to adults, thus on her list is to say “hi” to 10 people and give 3 of them a hug. My advice is to make each golfing outing be an adventure. This checklist engages your child at a new level, much to my surprise. Be sure to let them mark off the accomplishments. In the spirit of sharing best practices, what are some of the things you do when you take your child to the golf course to ensure you have fun?